Deconstructed Fish Tacos Bento, a photo by sherimiya ♥ on Flickr. Me, I love fish tacos. I like to grill the fish (I used cod here) in salt and pepper, then pile it into a tortilla along with onions and cilantro and a heaping dollop of salsa. Good right? But with kids, it never works out. Don't tell me your kids haven't at some point held the taco sideways so everything fell out, or took a bite and tore the whole thing in half, or dropped all the contents onto the floor and commenced screaming. Come on! After about age 8 (in our house), they finally seem to get it. But until then, I have discovered that it's easier to just forget about filling the taco and just let them eat the thing piecemeal. I've packed deconstructed (DIY) tacos before, where I roll up the tortillas and let them do what they will. Usually they eat them separately, plain. So I saved myself some trouble and used the Lunchbot Quad to pack a few pieces of cod in lettuce, and a cup of salsa (onion, tomato, cilantro, corn, cumin, pepper). She loved it. She especially liked the fish spear. I also squeezed in some white peach, blueberries, grapes and lychee, and some decorative carrots. What could be easier? Even now, my tacos fall apart, ha! I always try to stuff them too full, so taco salads seem to work the best for me. Such great colors in that bento! Delicious! And it looks great! I love deconstructed bento, it's such a genius way of stopping bento lunches being boring!!! 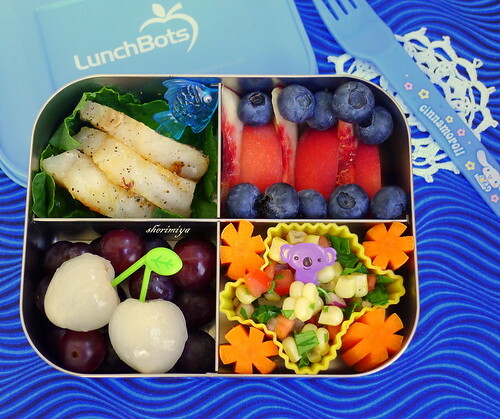 delicious looking bento, as usual! someday you've got to show us how you cut your carrots : ) I really appreciated your radish tutorial, BTW thanks for all the inspiration! Kristie! I remember you asked me about the carrot tutorial and I'm so negligent! Actually I have a case of summeritis; but I really do want to do that for you (and everyone) -- in fact I see traffic coming to look at the radish tutorial you so kindly linked over all the time. So thank you for that! Anyways, your bentos are once again so visually appealing that even the most pickiest child would want to eat it! I love that you use fish (especially Salmon) a lot. Gotta get those Omega 3's in :) And the salsa also looks unbelievably delicious! And thank you for the sweet encouraging comments; I really appreciate it!! I always love your bentos, everything looks so pretty and fresh. I'm taco challenged. They always fall apart, tear, or otherwise disintegrate. I love the idea for this bento. Lovely.